A modern architectural attraction, Lille's cathedral (dedicated to the Virgin Mary) is an imposing structure, begun as a basilica in 1854 in 13th-century Gothic style. Building continued slowly, interrupted by wars and financial constraints, but finally in 1999 the lofty building was declared complete after the perfection of the unique main façade, designed by local architect Pierre-Louis Carlier in collaboration with Peter Rice, who engineered the Sydney Opera House. The central marble section supported by steel wires is an impressive sight, particularly viewed from inside or at night, when it is revealed as resembling a pink translucent veil. From the outside it appears opaque but the marble is thin enough to let in a beautiful, gentle pink glow. 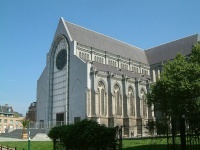 The church takes its name from the famous 12th-century statue of the Virgin Mary which was revered for centuries in Lille. This statue has a dramatic history and is associated with several miraculous events; it is a special part of Lille's heritage and cultural memory.